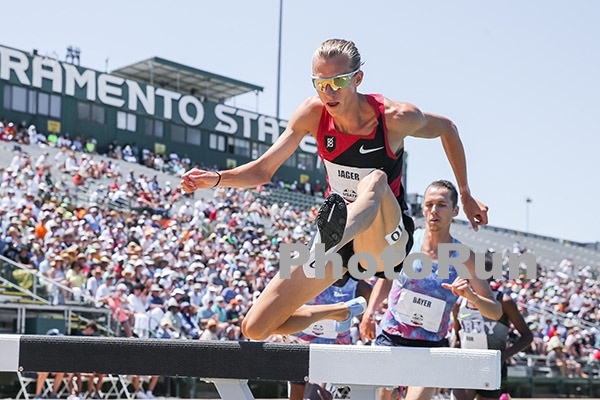 With a killer last lap of 56.70, Evan Jager won Sunday’s USATF steeplechase final in 8:16.88. Evan entered the bell lap leading a pack of four, but dispensed of them with his unmatchable finish; second finisher Stanley Kebenei was more than a second and a half back at the end. The victory not only earned Evan a spot at August’s World Championships but was also his sixth straight U.S. steeple title, dating to 2012, his first year in the event. The only longer streak in modern times is Henry Marsh’s 7-year run from 1981 through 1987. Evan is most likely far from his peak, given that Friday’s qualifying round was his first steeple of the year. Looking forward to London, where he’ll be joined by Bowerman Track Club teammates Amy Cragg (marathon), Emily Infeld (10,000), and Courtney Frerichs and Colleen Quigley (steeplechase).